For other uses, see Aramaic (disambiguation). This article is about the Semitic language now spoken by smaller numbers of people in scattered locations. For the Semitic language spoken in Ethiopia, see Amharic. Aramaic (Arāmāyā; square script אַרָמָיָא, Classical Syriac: ܐܪܡܝܐ‎) is a language or group of languages belonging to the Semitic subfamily of the Afroasiatic language family. More specifically, it is part of the Northwest Semitic group, which also includes the Canaanite languages such as Hebrew and Phoenician. The Aramaic alphabet was widely adopted for other languages and is ancestral to the Hebrew, Syriac and Arabic alphabets. During its approximately 3,100 years of written history, Aramaic has served variously as a language of administration of empires, as a language of divine worship and religious study, and as the spoken tongue of a number of Semitic peoples from the Near East. Historically, Aramaic was the language of the Arameans, a Semitic-speaking people of the region between the northern Levant and the northern Euphrates valley. By around 1000 BC, the Arameans had a string of kingdoms in what is now part of western Syria. Aramaic rose to prominence under the Neo-Assyrian Empire (911–605 BC), under whose influence Aramaic became a prestige language, and its use spread throughout most of Mesopotamia and the Levant. At its height, variants of Aramaic were spoken all over in what is today Iraq, Syria, Lebanon, Israel, Jordan, PalestinePalestinian Territories , Kuwait, Eastern Arabia, Northern Arabia, and to a lesser extent parts of southeast and south central Turkey, and parts of northwest Iran. Aramaic was the language of Jesus, who spoke the Galilean dialect during his public ministry, as well as the language of large sections of the biblical books of Daniel and Ezra, and also one of the languages of the Talmud. The scribes of the Neo-Assyrian bureaucracy had also used Aramaic, and this practice—together with other administrative practices—was subsequently inherited by the succeeding Neo-Babylonians (605–539 BC), and the Achaemenids (539–323 BC). Mediated by scribes that had been trained in the language, highly standardized written Aramaic (in its Achaemenid form called Imperial Aramaic) progressively also become the lingua franca of trade and commerce throughout the Achaemenid territories, which extended as far east as the Indus valley. (That use of written Aramaic subsequently led to the adoption of the Aramaic alphabet and—as logograms—some Aramaic vocabulary in the Pahlavi scripts, which were used by several Middle Iranian languages, including Parthian, Middle Persian, Sogdian, and Khwarazmian). Aramaic's long history and diverse and widespread use has led to the development of many divergent varieties, which are sometimes considered dialects, though they have become distinct enough over time that they are now sometimes considered as separate languages. Therefore, there is not one singular, static Aramaic language; each time and place rather has had its own variation. The more widely spoken Eastern Aramaic and Mandaic forms are today largely restricted to Iraqi Kurdistan, northeastern Syria, northwestern Iran and southeastern Turkey, whilst the severely endangered Western Neo-Aramaic is spoken by small communities in northwestern Syria. Certain dialects of Aramaic are also retained as a sacred language by certain religious communities. One of those liturgical dialects is Mandaic, which besides being a living variant of Aramaic is also the liturgical language of Mandaeism. Significantly more widespread is Syriac, the liturgical language of Syriac Christianity, in particular the Assyrian Church of the East, the Chaldean Catholic Church, the Syriac Orthodox Church, the Assyrian Pentecostal Church, Assyrian Evangelical Church, Ancient Church of the East, Syriac Catholic Church, the Maronite Church, and the Saint Thomas Christian denominations of India. Syriac was also the liturgical language of several now-extinct gnostic faiths, such as Manichaeism. Neo-Aramaic languages are still spoken today as a first language by many communities of Syriac Christians, Jews, and Mandaeans of Western Asia, most numerously by Chaldeans, Syriacs and Assyrians with numbers of fluent speakers ranging approximately from 1 million to 2 million, with the main languages among Assyrians being Assyrian Neo-Aramaic (235,000 speakers), Chaldean Neo-Aramaic (1 million speakers) and Turoyo (112,000 to 450,000 speakers), together with a number of smaller closely related languages with no more than 5,000 to 10,000 speakers between them. They have retained use of the once dominant lingua franca despite subsequent language shifts experienced throughout the Middle East. However, the Aramaic languages are now considered endangered. The languages are used by the older generation, all beyond retirement age, and so could go extinct within a generation. However, researchers are working to record all the dialects of Neo-Aramaic languages before they go extinct. Royal Aramaic inscriptions from the Aramean city-states date from 10th century BC, making Aramaic one of the world's oldest recorded living languages. "Aram" is used as a proper name of several people in the Torah (Hebrew Bible) including descendants of Shem (Genesis 10:22), Nahor (Genesis 22:21), and Jacob (1 Chronicles 7:34). Ancient Aram, bordering northern Israel and now called Syria, is considered the linguistic center of Aramaic, the language of the Arameans who settled the area during the Bronze Age circa 3500 BC. The language is often mistakenly considered to have originated within Assyria (Iraq). In fact, Arameans carried their language and writing into Mesopotamia by voluntary migration, by forced exile of conquering armies, and by nomadic Chaldean invasions of Babylonia during the period from 1200 to 1000 BC. 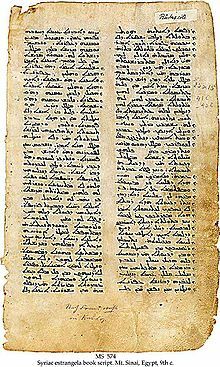 The Christian New Testament uses the Koine Greek word Ἑβραϊστί Hebraïstí to denote "Aramaic", as Aramaic was at that time the language commonly spoken by the Jews. The Hellenized Jewish community of Alexandria instead translated "Aramaic" to "the Syrian tongue". During the Neo-Assyrian and Neo-Babylonian Empires, Arameans, the native speakers of Aramaic, began to settle in greater numbers, at first in Babylonia, and later in Assyria (Upper Mesopotamia, modern-day northern Iraq, northeast Syria, northwest Iran, and south eastern Turkey (what was Armenia at the time). The influx eventually resulted in the Neo-Assyrian Empire (911–605 BC) adopting an Akkadian-influenced Imperial Aramaic as the lingua franca of its empire. This policy was continued by the short-lived Neo-Babylonian Empire and Medes, and all three empires became operationally bilingual in written sources, with Aramaic used alongside Akkadian. The Achaemenid Empire (539–323 BC) continued this tradition, and the extensive influence of these empires led to Aramaic gradually becoming the lingua franca of most of western Asia, the Arabian Peninsula, Anatolia, the Caucasus, and Egypt. Beginning with the rise of the Rashidun Caliphate in the late 7th century, Arabic gradually replaced Aramaic as the lingua franca of the Middle East. However, Aramaic remains a spoken, literary, and liturgical language for local Christians and also some Jews. Aramaic also continues to be spoken by the Assyrians of Iraq, northeastern Syria, southeastern Turkey and northwest Iran, with diaspora communities in Armenia, Georgia, Azerbaijan and southern Russia. The Mandaeans also continue to use Mandaic Aramaic as a liturgical language, although most now speak Arabic as their first language. There are still also a small number of first-language speakers of Western Aramaic varieties in isolated villages in western Syria. The turbulence of the last two centuries (particularly the Assyrian genocide) has seen speakers of first-language and literary Aramaic dispersed throughout the world. However, there are a number of sizable Assyrian towns in northern Iraq such as Alqosh, Bakhdida, Bartella, Tesqopa, and Tel Keppe, and numerous small villages, where Aramaic is still the main spoken language, and many large cities in this region also have Assyrian Aramaic-speaking communities, particularly Mosul, Erbil, Kirkuk, Dohuk, and al-Hasakah. Aramaic is also experiencing a revival among Maronites in Israel in Jish. Aramaic is often spoken of as a single language, but is in reality a group of related languages. Some Aramaic languages differ more from each other than the Romance languages do among themselves. Its long history, extensive literature, and use by different religious communities are all factors in the diversification of the language. Some Aramaic dialects are mutually intelligible, whereas others are not, not unlike the situation with modern varieties of Arabic. Some Aramaic languages are known under different names; for example, Syriac is particularly used to describe the Eastern Aramaic variety used in Christian ethnic communities in Iraq, southeastern Turkey, northeastern Syria, and northwestern Iran, and Saint Thomas Christians in India. Most dialects can be described as either "Eastern" or "Western", the dividing line being roughly the Euphrates, or slightly west of it. It is also helpful to draw a distinction between those Aramaic languages that are modern living languages (often called "Neo-Aramaic"), those that are still in use as literary languages, and those that are extinct and are only of interest to scholars. Although there are some exceptions to this rule, this classification gives "Modern", "Middle", and "Old" periods, alongside "Eastern" and "Western" areas, to distinguish between the various languages and dialects that are Aramaic. The earliest Aramaic alphabet was based on the Phoenician alphabet. In time, Aramaic developed its distinctive "square" style. The ancient Israelites and other peoples of Canaan adopted this alphabet for writing their own languages. Thus, it is better known as the Hebrew alphabet today. This is the writing system used in Biblical Aramaic and other Jewish writing in Aramaic. The other main writing system used for Aramaic was developed by Christian communities: a cursive form known as the Syriac alphabet. A highly modified form of the Aramaic alphabet, the Mandaic alphabet, is used by the Mandaeans. In addition to these writing systems, certain derivatives of the Aramaic alphabet were used in ancient times by particular groups: the Nabataean alphabet in Petra and the Palmyrene alphabet in Palmyra. In modern times, Turoyo (see below) has sometimes been written in a Latin script. The Biblical Aramaic of the Hebrew Bible. The Aramaic of Jesus (Jewish Palestinian Aramaic). The Aramaic of the Talmudim, Targumim, and Midrashim. This classification is based on that used by Klaus Beyer. The term "Old Aramaic" is used to describe the varieties of the language from its first known use until the point roughly marked by the rise of the Sasanian Empire (224 AD), dominating the influential, eastern dialect region. As such, the term covers over thirteen centuries of the development of Aramaic. This vast time span includes all Aramaic that is now effectively extinct. The central phase in the development of Old Aramaic was its official use by the Achaemenid Empire (500–330 BC). The period before this, dubbed "Ancient Aramaic", saw the development of the language from being spoken in Aramaean city-states to become a major means of communication in diplomacy and trade throughout Mesopotamia, the Levant and Egypt. After the fall of the Achaemenid Empire, local vernaculars became increasingly prominent, fanning the divergence of an Aramaic dialect continuum and the development of differing written standards. "Ancient Aramaic" refers to the earliest known period of the language, from its origin until it becomes the lingua franca of the Fertile Crescent. It was the language of the Aramean city-states of Damascus, Hamath and Arpad. Silver ingot of Bar-Rakib, son of Panammuwa II, King of Sam'al. There are inscriptions that evidence the earliest use of the language, dating from the 10th century BC. These inscriptions are mostly diplomatic documents between Aramaean city-states. The alphabet of Aramaic at this early period seems to be based on the Phoenician alphabet, and there is a unity in the written language. It seems that, in time, a more refined alphabet, suited to the needs of the language, began to develop from this in the eastern regions of Aram. Due to increasing Aramean migration eastward, the Western periphery of Assyria became bilingual in Akkadian and Aramean at least as early as the mid-9th century BC. As the Neo-Assyrian Empire conquered Aramean lands west of the Euphrates, Tiglath-Pileser III made Aramaic the Empire's second official language, and it eventually supplanted Akkadian completely. From 700 BC, the language began to spread in all directions, but lost much of its unity. Different dialects emerged in Assyria, Babylonia, the Levant and Egypt. 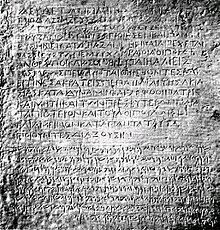 Around 600 BC, Adon, a Canaanite king, used Aramaic to write to an Egyptian Pharaoh. "Chaldee" or "Chaldean Aramaic" used to be common terms for the Aramaic of the Chaldean dynasty of Babylonia. 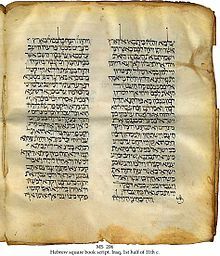 It was used to describe Biblical Aramaic, which was, however, written in a later style. It is not to be confused with the modern language Chaldean Neo-Aramaic. Around 500 BC, following the Achaemenid (Persian) conquest of Mesopotamia under Darius I, Aramaic (as had been used in that region) was adopted by the conquerors as the "vehicle for written communication between the different regions of the vast empire with its different peoples and languages. The use of a single official language, which modern scholarship has dubbed Official Aramaic or Imperial Aramaic, can be assumed to have greatly contributed to the astonishing success of the Achaemenids in holding their far-flung empire together for as long as they did". In 1955, Richard Frye questioned the classification of Imperial Aramaic as an "official language", noting that no surviving edict expressly and unambiguously accorded that status to any particular language. Frye reclassifies Imperial Aramaic as the lingua franca of the Achaemenid territories, suggesting then that the Achaemenid-era use of Aramaic was more pervasive than generally thought. Imperial Aramaic was highly standardised; its orthography was based more on historical roots than any spoken dialect, and the inevitable influence of Persian gave the language a new clarity and robust flexibility. For centuries after the fall of the Achaemenid Empire (in 331 BC), Imperial Aramaic – or a version thereof near enough for it to be recognisable – would remain an influence on the various native Iranian languages. Aramaic script and – as ideograms – Aramaic vocabulary would survive as the essential characteristics of the Pahlavi scripts. One of the largest collections of Imperial Aramaic texts is that of the Persepolis fortification tablets, which number about five hundred. Many of the extant documents witnessing to this form of Aramaic come from Egypt, and Elephantine in particular (see Elephantine papyri). Of them, the best known is the Story of Ahikar, a book of instructive aphorisms quite similar in style to the biblical Book of Proverbs. Achaemenid Aramaic is sufficiently uniform that it is often difficult to know where any particular example of the language was written. Only careful examination reveals the occasional loan word from a local language. A group of thirty Aramaic documents from Bactria have been discovered, and an analysis was published in November 2006. The texts, which were rendered on leather, reflect the use of Aramaic in the 4th century BC Achaemenid administration of Bactria and Sogdia. The conquest by Alexander the Great did not destroy the unity of Aramaic language and literature immediately. Aramaic that bears a relatively close resemblance to that of the 5th century BC can be found right up to the early 2nd century BC. The Seleucids imposed Greek in the administration of Syria and Mesopotamia from the start of their rule. In the 3rd century BC, Greek overtook Aramaic as the common[clarification needed] language in Egypt and Syria. However, a post-Achaemenid Aramaic continued to flourish from Judaea, Assyria, Mesopotamia, through the Syrian Desert and into northern Arabia. Ezra 4:8–6:18 and 7:12–26 – documents from the Achaemenid period (5th century BC) concerning the restoration of the temple in Jerusalem. Daniel 2:4b–7:28 – five subversive tales and an apocalyptic vision. Jeremiah 10:11 – a single sentence in the middle of a Hebrew text denouncing idolatry. Genesis 31:47 – translation of a Hebrew place-name. Biblical Aramaic is a somewhat hybrid dialect. It is theorized that some Biblical Aramaic material originated in both Babylonia and Judaea before the fall of the Achaemenid dynasty. According to historical criticism, defiant Jewish propaganda shaped Aramaic Daniel during Seleucid rule. These stories might have existed as oral traditions at their earliest stage. This might be one factor that led to differing collections of Daniel in the Greek Septuagint and the Masoretic Text, which presents a lightly Hebrew-influenced Aramaic. Under the category of post-Achaemenid is Hasmonaean Aramaic, the official administrative language of Hasmonaean Judaea (142–37 BC), alongside Hebrew which was the language preferred on coinage and other public uses. 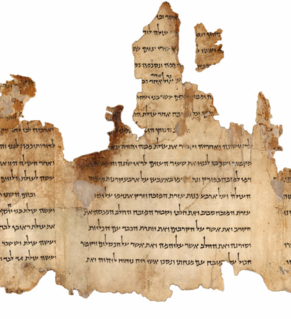 It influenced the Biblical Aramaic of the Qumran texts, and was the main language of non-biblical theological texts of that community. The major Targums, translations of the Hebrew Bible into Aramaic, were originally composed in Hasmonaean. Hasmonaean also appears in quotations in the Mishnah and Tosefta, although smoothed into its later context. It is written quite differently from Achaemenid Aramaic; there is an emphasis on writing as words are pronounced rather than using etymological forms. Babylonian Targumic is the later post-Achaemenid dialect found in the Targum Onqelos and Targum Jonathan, the "official" targums. The original, Hasmonaean targums had reached Babylon sometime in the 2nd or 3rd century AD. They were then reworked according to the contemporary dialect of Babylon to create the language of the standard targums. This combination formed the basis of Babylonian Jewish literature for centuries to follow. Galilean Targumic is similar to Babylonian Targumic. It is the mixing of literary Hasmonaean with the dialect of Galilee. The Hasmonaean targums reached Galilee in the 2nd century AD, and were reworked into this Galilean dialect for local use. The Galilean Targum was not considered an authoritative work by other communities, and documentary evidence shows that its text was amended. From the 11th century AD onwards, once the Babylonian Targum had become normative, the Galilean version became heavily influenced by it. Babylonian Documentary Aramaic is a dialect in use from the 3rd century AD onwards. It is the dialect of Babylonian private documents, and, from the 12th century, all Jewish private documents are in Aramaic. It is based on Hasmonaean with very few changes. This was perhaps because many of the documents in BDA are legal documents, the language in them had to be sensible throughout the Jewish community from the start, and Hasmonaean was the old standard. Nabataean Aramaic is the language of the Arameo-Arab kingdom of Petra. The kingdom (c. 200 BC – 106 AD) covered the east bank of the Jordan River, the Sinai Peninsula and northern Arabia. Perhaps because of the importance of the caravan trade, the Nabataeans began to use Aramaic in preference to Old North Arabic. The dialect is based on Achaemenid with a little influence from Arabic: "l" is often turned into "n", and there are a few Arabic loanwords. Some Nabataean Aramaic inscriptions exist from the early days of the kingdom, but most are from the first four centuries AD The language is written in a cursive script that is the precursor to the modern Arabic alphabet. The number of Arabic loanwords increases through the centuries, until, in the 4th century, Nabataean merges seamlessly with Arabic. Palmyrene Aramaic is the dialect that was in use in the Syriac city state of Palmyra in the Syrian Desert from 44 BC to 274 AD. It was written in a rounded script, which later gave way to cursive Estrangela. Like Nabataean, Palmyrene was influenced by Arabic, but to a much lesser degree. The use of written Aramaic in the Achaemenid bureaucracy also precipitated the adoption of Aramaic(-derived) scripts to render a number of Middle Iranian languages. Moreover, many common words, including even pronouns, particles, numerals, and auxiliaries, continued to written as Aramaic "words" even when writing Middle Iranian languages. In time, in Iranian usage, these Aramaic "words" became disassociated from the Aramaic language and came to be understood as signs (i.e. logograms), much like the symbol '&' is read as "and" in English and the original Latin et is now no longer obvious. Under the early 3rd-century BC Parthians Arsacids, whose government used Greek but whose native language was Parthian, the Parthian language and its Aramaic-derived writing system both gained prestige. This in turn also led to the adoption of the name 'pahlavi' (< parthawi, "of the Parthians") for that writing system. The Persian Sassanids, who succeeded the Parthian Arsacids in the mid-3rd century AD, subsequently inherited/adopted the Parthian-mediated Aramaic-derived writing system for their own Middle Iranian ethnolect as well. That particular Middle Iranian dialect, Middle Persian, i.e. the language of Persia proper, subsequently also became a prestige language. Following the conquest of the Sassanids by the Arabs in the 7th-century, the Aramaic-derived writing system was replaced by Arabic script in all but Zoroastrian usage, which continued to use the name 'pahlavi' for the Aramaic-derived writing system and went on to create the bulk of all Middle Iranian literature in that writing system. The dialects mentioned in the last section were all descended from Achaemenid Imperial Aramaic. However, the diverse regional dialects of Late Ancient Aramaic continued alongside these, often as simple, spoken languages. Early evidence for these spoken dialects is known only through their influence on words and names in a more standard dialect. However, these regional dialects became written languages in the 2nd century BC. These dialects reflect a stream of Aramaic that is not dependent on Imperial Aramaic, and shows a clear division between the regions of Mesopotamia, Babylon and the east, and Judah, Syria, and the west. In the East, the dialects of Palmyrene and Arsacid Aramaic merged with the regional languages to create languages with a foot in Imperial and a foot in regional Aramaic. The written form of Mandaic, the language of the Mandaean religion, was descended from the Arsacid chancery script. In the kingdom of Osroene, centred on Edessa and founded in 132 BC, the regional dialect became the official language: Old Syriac. On the upper reaches of the Tigris, East Mesopotamian Aramaic flourished, with evidence from Hatra, Assur and the Tur Abdin. Tatian, the author of the gospel harmony the Diatessaron came from Assyria, and perhaps wrote his work (172 AD) in East Mesopotamian rather than Syriac or Greek. In Babylonia, the regional dialect was used by the Jewish community, Jewish Old Babylonian (from c. 70 AD). This everyday language increasingly came under the influence of Biblical Aramaic and Babylonian Targumic. The western regional dialects of Aramaic followed a similar course to those of the east. They are quite distinct from the eastern dialects and Imperial Aramaic. Aramaic came to coexist with Canaanite dialects, eventually completely displacing Phoenician in the first century BC and Hebrew around the turn of the fourth century AD. The form of Late Old Western Aramaic used by the Jewish community is best attested, and is usually referred to as Jewish Old Palestinian. Its oldest form is Old East Jordanian, which probably comes from the region of Caesarea Philippi. This is the dialect of the oldest manuscript of the Book of Enoch (c. 170 BC). The next distinct phase of the language is called Old Judaean into the second century AD. Old Judean literature can be found in various inscriptions and personal letters, preserved quotations in the Talmud and receipts from Qumran. Josephus' first, non-extant edition of his The Jewish War was written in Old Judean. The Old East Jordanian dialect continued to be used into the first century AD by pagan communities living to the east of the Jordan. Their dialect is often then called Pagan Old Palestinian, and it was written in a cursive script somewhat similar to that used for Old Syriac. A Christian Old Palestinian dialect may have arisen from the pagan one, and this dialect may be behind some of the Western Aramaic tendencies found in the otherwise eastern Old Syriac gospels (see Peshitta). It is generally believed by Christian scholars that in the first century, Jews in Judea primarily spoke Aramaic with a decreasing number using Hebrew as their first language, though many learned Hebrew as a liturgical language. Additionally, Koine Greek was the lingua franca of the Middle East in trade, among the Hellenized classes (much like French in the 18th,19th and 20th centuries in Europe), and in the Roman administration. Latin, the language of the Roman army and higher levels of administration, had almost no impact on the linguistic landscape. In addition to the formal, literary dialects of Aramaic based on Hasmonean and Babylonian, there were a number of colloquial Aramaic dialects. Seven Western Aramaic varieties were spoken in the vicinity of Judea in Jesus' time. They were probably distinctive yet mutually intelligible. Old Judean was the prominent dialect of Jerusalem and Judaea. The region of Ein Gedi spoke the Southeast Judaean dialect. Samaria had its distinctive Samaritan Aramaic, where the consonants "he", "heth" and "‘ayin" all became pronounced as "aleph". Galilean Aramaic, the dialect of Jesus' home region, is only known from a few place names, the influences on Galilean Targumic, some rabbinic literature and a few private letters. It seems to have a number of distinctive features: diphthongs are never simplified into monophthongs. East of the Jordan, the various dialects of East Jordanian were spoken. In the region of Damascus and the Anti-Lebanon Mountains, Damascene Aramaic was spoken (deduced mostly from Modern Western Aramaic). Finally, as far north as Aleppo, the western dialect of Orontes Aramaic was spoken. The three languages influenced one another, especially Hebrew and Aramaic. Hebrew words entered Jewish Aramaic (mostly technical religious words but also everyday words like עץ ʿēṣ "wood"). Conversely, Aramaic words entered Hebrew (not only Aramaic words like māmmôn "wealth" but Aramaic ways of using words like making Hebrew ראוי rā’ûi, "seen" mean "worthy" in the sense of "seemly", which is a calque of Aramaic ḥzî meaning "seen" and "worthy"). Some are Aramaic, like talitha (ταλιθα), which represents the noun טליתא ṭalyĕṯā (Mark 5:41). Others can be either Hebrew or Aramaic like רבוני Rabbounei (Ραββουνει), which stands for "my master/great one/teacher" in both languages (John 20:16). The 2004 film The Passion of the Christ used Aramaic for much of its dialogue, specially reconstructed by a scholar, William Fulco, S.J. Where the appropriate words (in first-century Aramaic) were no longer known, he used the Aramaic of Daniel and fourth-century Syriac and Hebrew as the basis for his work. The 3rd century AD is taken as the threshold between Old and Middle Aramaic. During that century, the nature of the various Aramaic languages and dialects began to change. The descendants of Imperial Aramaic ceased to be living languages, and the eastern and western regional languages began to develop vital new literatures. Unlike many of the dialects of Old Aramaic, much is known about the vocabulary and grammar of Middle Aramaic. Only two of the Old Eastern Aramaic languages continued into this period. In the north of the region, Old Syriac transitioned into Middle Syriac. In the south, Jewish Old Babylonian became Jewish Middle Babylonian. The post-Achaemenid, Arsacid dialect became the background of the new Mandaic language. Syriac (also "Middle Syriac") is the classical, literary, liturgical and often spoken language of Syriac Christianity to this day, particularly the Assyrian Church of the East, Chaldean Catholic Church, Ancient Church of the East, Syriac Orthodox Church and Saint Thomas Christians. It originated in fifth century BC Achaemenid Assyria, but its golden age was the fourth to sixth centuries. This period began with the translation of the Bible into the language: the Peshitta and the masterful prose and poetry of Ephrem the Syrian. Middle Syriac became the language of those opposed to the Byzantine leadership of the Church of the East. Missionary activity by Assyrian and Nestorian Christians led to the spread of Syriac from Mesopotamia and Persia, into Central Asia, India and China. Jewish Middle Babylonian is the language employed by Jewish writers in Babylonia between the fourth and the eleventh century. It is most commonly identified with the language of the Babylonian Talmud (which was completed in the seventh century) and of post-Talmudic Geonic literature, which are the most important cultural products of Babylonian Judaism. The most important epigraphic sources for the dialect are the hundreds of incantation bowls written in Jewish Babylonian Aramaic. The Mandaic language, spoken by the Mandaeans of Iraq, is a sister dialect to Jewish Babylonian Aramaic, though it is both linguistically and culturally distinct. Classical Mandaic is the language in which the Mandaeans' gnostic religious literature was composed. It is characterized by a highly phonetic orthography. In 135, after the Bar Kokhba revolt, many Jewish leaders, expelled from Jerusalem, moved to Galilee. The Galilean dialect thus rose from obscurity to become the standard among Jews in the west. This dialect was spoken not only in Galilee, but also in the surrounding parts. It is the linguistic setting for the Jerusalem Talmud (completed in the 5th century), Palestinian targumim (Jewish Aramaic versions of scripture), and midrashim (biblical commentaries and teaching). The standard vowel pointing for the Hebrew Bible, the Tiberian system (7th century), was developed by speakers of the Galilean dialect of Jewish Middle Palestinian. Classical Hebrew vocalisation, therefore, in representing the Hebrew of this period, probably reflects the contemporary pronunciation of this Aramaic dialect. Middle Judaean, the descendant of Old Judaean, was no longer the dominant dialect, and was used only in southern Judaea (the variant Engedi dialect continued throughout this period). Likewise, Middle East Jordanian continued as a minor dialect from Old East Jordanian. The inscriptions in the synagogue at Dura-Europos are either in Middle East Jordanian or Middle Judaean. The Samaritan Aramaic is earliest attested by the documentary tradition of the Samaritans that can be dated back to the fourth century. Its modern pronunciation is based on the form used in the tenth century. This was the language of the Christian Melkite community from the 5th to the 8th century. It was also used from the 10th to 13th centuries, though probably only as a liturgical language. It is also been called "Melkite Aramaic" and "Palestinian Syriac". The language itself comes from Old Christian Palestinian Aramaic, but its writing conventions were based on early Middle Syriac, and it was heavily influenced by Greek. For example, the name Jesus, although ישוע Yešua’ in Jewish Aramaic, and Išo in Syriac, is written Yesûs (a transliteration of the Greek form) in Christian Palestinian. As the Western Aramaic languages of the Levant and Lebanon have become nearly extinct in non-liturgical usage, the most prolific speakers of Aramaic dialects today are predominantly ethnic Assyrian Eastern Neo-Aramaic speakers, the most numerous being the Northeastern Neo-Aramaic speakers of Mesopotamia. This includes speakers of Assyrian Neo-Aramaic (235,000 speakers), Chaldean Neo-Aramaic (216,000 speakers), and Turoyo (Surayt) (112,000 to 450,000 speakers). Having largely lived in remote areas as insulated communities for over a millennium, the remaining modern Aramaic dialects, such as the Assyrians, and the Arameans, escaped the linguistic pressures experienced by others during the large-scale language shifts that saw the proliferation of other tongues among those who previously did not speak them, most recently the Arabization of the Middle East and North Africa by Arabs beginning with the early Muslim conquests of the seventh century. Another Eastern Aramaic language, Neo-Mandaean, is spoken by the Mandaeans of Iraq and Iran. They number some 50,000–75,000 people, but it is believed the Mandaic language may now be spoken fluently by as few as 5,000 people, with other Mandaeans having varying degrees of knowledge. Modern Eastern Aramaic exists in a wide variety of dialects and languages. There is significant difference between the Aramaic spoken by Jews, Christians, and Mandaeans. The Christian varieties are often called Modern Syriac (or Neo-Syriac, particularly when referring to their literature), being deeply influenced by the literary and liturgical language of Middle Syriac. However, they also have roots in numerous, previously unwritten, local Aramaic varieties, and are not purely the direct descendants of the language of Ephrem the Syrian. The varieties are not all mutually intelligible. The principal Christian varieties are Assyrian Neo-Aramaic and Chaldean Neo-Aramaic, both used by the ethnic Assyrians of Iraq, southeast Turkey, Iran, and northeast Syria. The Judeo-Aramaic languages are now mostly spoken in Israel, and most are facing extinction. The Jewish varieties that have come from communities that once lived between Lake Urmia and Mosul are not all mutually intelligible. In some places, for example Urmia, Assyrian Christians and Jews speak mutually unintelligible varieties of Modern Eastern Aramaic in the same place. In others, the Nineveh plains around Mosul for example, the varieties of these two ethnic communities are similar enough to allow conversation. Modern Central Neo-Aramaic, being in between Western Neo-Aramaic and Eastern Neo-Aramaic) is generally represented by Turoyo, the language of the Assyrians of Tur Abdin. A related language, Mlahsô, has recently become extinct. Mandaeans living in the Khuzestan Province of Iran and scattered throughout Iraq, speak Modern Mandaic. It is quite distinct from any other Aramaic variety. Central Neo-Aramaic consists of Turoyo and the recently extinct Mlahsô. Very little remains of Western Aramaic. It is still spoken in the villages of Maaloula, al-Sarkha (Bakhah), and Jubb'adin on Syria's side of the Anti-Lebanon Mountains, as well as by some people who migrated from these villages, to Damascus and other larger towns of Syria. All these speakers of Modern Western Aramaic are fluent in Arabic as well. Jewish Palestinian Aramaic and Samaritan Aramaic are preserved in liturgical and literary usage. Each dialect of Aramaic has its own distinctive pronunciation, and it would not be feasible here to go into all these properties. Aramaic has a phonological palette of 25 to 40 distinct phonemes. Some modern Aramaic pronunciations lack the series of "emphatic" consonants, and some have borrowed from the inventories of surrounding languages, particularly Arabic, Azerbaijani, Kurdish, Persian and Turkish. These vowel groups are relatively stable, but the exact articulation of any individual is most dependent on its consonantal setting. The open vowel is an open near-front unrounded vowel ("short" a, somewhat like the first vowel in the English "batter", [a]). It usually has a back counterpart ("long" a, like the a in "father", [ɑ], or even tending to the vowel in "caught", [ɔ]), and a front counterpart ("short" e, like the vowel in "head", [ɛ]). There is much correspondence between these vowels between dialects. There is some evidence that Middle Babylonian dialects did not distinguish between the short a and short e. In West Syriac dialects, and possibly Middle Galilean, the long a became the o sound. The open e and back a are often indicated in writing by the use of the letters א "alaph" (a glottal stop) or ה "he" (like the English h). The close front vowel is the "long" i (like the vowel in "need", [i]). It has a slightly more open counterpart, the "long" e, as in the final vowel of "café" ([e]). Both of these have shorter counterparts, which tend to be pronounced slightly more open. Thus, the short close e corresponds with the open e in some dialects. The close front vowels usually use the consonant י y as a mater lectionis. The close back vowel is the "long" u (like the vowel in "school", [u]). It has a more open counterpart, the "long" o, like the vowel in "low" ([o]). There are shorter, and thus more open, counterparts to each of these, with the short close o sometimes corresponding with the long open a. The close back vowels often use the consonant ו w to indicate their quality. Two basic diphthongs exist: an open vowel followed by י y (ay), and an open vowel followed by ו w (aw). These were originally full diphthongs, but many dialects have converted them to e and o respectively. The so-called "emphatic" consonants (see the next section) cause all vowels to become mid-centralised. Velar set: כּ\כ k/x and גּ\ג g/ɣ. Each member of a certain pair is written with the same letter of the alphabet in most writing systems (that is, p and f are written with the same letter), and are near allophones. ק Qôp, a voiceless uvular stop, /q/. Ancient Aramaic may have had a larger series of emphatics, and some Neo-Aramaic languages definitely do. Not all dialects of Aramaic give these consonants their historic values. Overlapping with the set of emphatics are the "guttural" consonants. They include ח Ḥêṯ and ע ʽAyn from the emphatic set, and add א ʼĀlap̄ (a glottal stop) and ה Hê (as the English "h"). צ /sˤ/ (the emphatic Ṣāḏê listed above). In addition to these sets, Aramaic has the nasal consonants מ m and נ n, and the approximants ר r (usually an alveolar trill), ל l, י y and ו w.
Vowel change occurs almost too frequently to document fully, but is a major distinctive feature of different dialects. Plosive/fricative pair reduction. Originally, Aramaic, like Tiberian Hebrew, had fricatives as conditioned allophones for each plosive. In the wake of vowel changes, the distinction eventually became phonemic; still later, it was often lost in certain dialects. For example, Turoyo has mostly lost /p/, using /f/ instead, like Arabic; other dialects (for instance, standard Assyrian Neo-Aramaic) have lost /θ/ and /ð/ and replaced them with /t/ and /d/, as with Modern Hebrew. In most dialects of Modern Syriac, /f/ and /v/ are realized as [w] after a vowel. Loss of emphatics. Some dialects have replaced emphatic consonants with non-emphatic counterparts, while those spoken in the Caucasus often have glottalized rather than pharyngealized emphatics. Guttural assimilation is the main distinctive feature of Samaritan pronunciation, also found in Samaritan Hebrew: all the gutturals are reduced to a simple glottal stop. Some Modern Aramaic dialects do not pronounce h in all words (the third person masculine pronoun hu becomes ow). Proto-Semitic */θ/ */ð/ are reflected in Aramaic as */t/, */d/, whereas they became sibilants in Hebrew (the number three is שלוש šālôš in Hebrew but תלת tlāṯ in Aramaic). Dental/sibilant shifts are still happening in the modern dialects. New phonetic inventory. Modern dialects have borrowed sounds from the dominant surrounding languages. The most frequent borrowings are [ʒ] (as the first consonant in "azure"), [d͡ʒ] (as in "jam") and [t͡ʃ] (as in "church"). The Syriac alphabet has been adapted for writing these new sounds. כתבה kṯāḇâ, handwriting, inscription, script, book. כתבי kṯāḇê, books, the Scriptures. אכתב 'eḵtûḇ, I shall write. Aramaic nouns and adjectives are inflected to show gender, number and state. Aramaic has two grammatical genders: masculine and feminine. The feminine absolute singular is often marked by the ending ה- -â.
Nouns can be either singular or plural, but an additional "dual" number exists for nouns that usually come in pairs. The dual number gradually disappeared from Aramaic over time and has little influence in Middle and Modern Aramaic. The absolute state is the basic form of a noun. In early forms of Aramaic, the absolute state expresses indefiniteness, comparable to the English indefinite article a(n) (for example, כתבה kṯāḇâ, "a handwriting"), and can be used in most syntactic roles. However, by the Middle Aramaic period, its use for nouns (but not adjectives) had been widely replaced by the emphatic state. The construct state is a form of the noun used to make possessive constructions (for example, כתבת מלכתא kṯāḇat malkṯâ, "the handwriting of the queen"). In the masculine singular the form of the construct is often the same as the absolute, but it may undergo vowel reduction in longer words. The feminine construct and masculine construct plural are marked by suffixes. Unlike a genitive case, which marks the possessor, the construct state is marked on the possessed. This is mainly due to Aramaic word order: possessed[const.] possessor[abs./emph.] are treated as a speech unit, with the first unit (possessed) employing the construct state to link it to the following word. In Middle Aramaic, the use of the construct state for all but stock phrases (like בר נשא bar nāšâ, "son of man") begins to disappear. The emphatic or determined state is an extended form of the noun that functions similarly to the definite article. It is marked with a suffix (for example, כתבתא kṯāḇtâ, "the handwriting"). Although its original grammatical function seems to have been to mark definiteness, it is used already in Imperial Aramaic to mark all important nouns, even if they should be considered technically indefinite. This practice developed to the extent that the absolute state became extraordinarily rare in later varieties of Aramaic. Whereas other Northwest Semitic languages, like Hebrew, have the absolute and construct states, the emphatic/determined state is a unique feature to Aramaic. Case endings, as in Ugaritic, probably existed in a very early stage of the language, and glimpses of them can be seen in a few compound proper names. However, as most of those cases were expressed by short final vowels, they were never written, and the few characteristic long vowels of the masculine plural accusative and genitive are not clearly evidenced in inscriptions. Often, the direct object is marked by a prefixed -ל l- (the preposition "to") if it is definite. Adjectives agree with their nouns in number and gender but agree in state only if used attributively. Predicative adjectives are in the absolute state regardless of the state of their noun (a copula may or may not be written). Thus, an attributive adjective to an emphatic noun, as in the phrase "the good king", is written also in the emphatic state מלכא טבא malkâ ṭāḇâ—king[emph.] good[emph.]. In comparison, the predicative adjective, as in the phrase "the king is good", is written in the absolute state מלכא טב malkâ ṭāḇ—king[emph.] good[abs.]. The final א- -â in a number of these suffixes is written with the letter aleph. However, some Jewish Aramaic texts employ the letter he for the feminine absolute singular. Likewise, some Jewish Aramaic texts employ the Hebrew masculine absolute singular suffix ים- -îm instead of ין- -în. The masculine determined plural suffix, יא- -ayyâ, has an alternative version, -ê. The alternative is sometimes called the "gentilic plural" for its prominent use in ethnonyms (יהודיא yəhûḏāyê, 'the Jews', for example). This alternative plural is written with the letter aleph, and came to be the only plural for nouns and adjectives of this type in Syriac and some other varieties of Aramaic. The masculine construct plural, -ê, is written with yodh. In Syriac and some other variants this ending is diphthongized to -ai. Possessive phrases in Aramaic can either be made with the construct state or by linking two nouns with the relative particle -[ד[י d[î]-. As the use of the construct state almost disappears from the Middle Aramaic period on, the latter method became the main way of making possessive phrases. כתבתה דמלכתא kṯāḇtāh d(î)-malkṯâ – both words are in the emphatic state, and the relative particle is used, but the possessed is given an anticipatory, pronominal ending (כתבתה kṯāḇtā-h, "handwriting-her"; literally, "her writing, that (of) the queen"). In Modern Aramaic, the last form is by far the most common. In Biblical Aramaic, the last form is virtually absent. The Aramaic verb has gradually evolved in time and place, varying between varieties of the language. Verb forms are marked for person (first, second or third), number (singular or plural), gender (masculine or feminine), tense (perfect or imperfect), mood (indicative, imperative, jussive or infinitive) and voice (active, reflexive or passive). Aramaic also employs a system of conjugations, or verbal stems, to mark intensive and extensive developments in the lexical meaning of verbs. Aramaic has two proper tenses: perfect and imperfect. These were originally aspectual, but developed into something more like a preterite and future. The perfect is unmarked, while the imperfect uses various preformatives that vary according to person, number and gender. In both tenses the third-person singular masculine is the unmarked form from which others are derived by addition of afformatives (and preformatives in the imperfect). In the chart below (on the root כת״ב K-T-B, meaning "to write"), the first form given is the usual form in Imperial Aramaic, while the second is Classical Syriac. Like other Semitic languages, Aramaic employs a number of derived verb stems, to extend the lexical coverage of verbs. The basic form of the verb is called the ground stem, or G-stem. Following the tradition of mediaeval Arabic grammarians, it is more often called the Pə‘al פעל (also written Pe‘al), using the form of the Semitic root פע״ל P-‘-L, meaning "to do". This stem carries the basic lexical meaning of the verb. By doubling of the second radical, or root letter, the D-stem or פעל Pa‘‘el is formed. This is often an intensive development of the basic lexical meaning. For example, qəṭal means "he killed", whereas qaṭṭel means "he slew". The precise relationship in meaning between the two stems differs for every verb. A preformative, which can be -ה ha-, -א a- or -ש ša-, creates the C-stem or variously the Hap̄‘el, Ap̄‘el or Šap̄‘el (also spelt הפעל Haph‘el, אפעל Aph‘el and שפעל Shaph‘el). This is often an extensive or causative development of the basic lexical meaning. For example, טעה ṭə‘â means "he went astray", whereas אטעי aṭ‘î means "he deceived". The Šap̄‘el שפעל is the least common variant of the C-stem. Because this variant is standard in Akkadian, it is possible that its use in Aramaic represents loanwords from that language. The difference between the variants הפעל Hap̄‘el and אפעל Ap̄‘el appears to be the gradual dropping of the initial ה h sound in later Old Aramaic. This is noted by the respelling of the older he preformative with א aleph. These three conjugations are supplemented with three further derived stems, produced by the preformative -הת hiṯ- or -את eṯ-. The loss of the initial ה h sound occurs similarly to that in the form above. These three derived stems are the Gt-stem, התפעל Hiṯpə‘el or אתפעל Eṯpə‘el (also written Hithpe‘el or Ethpe‘el), the Dt-stem, התפעּל Hiṯpa‘‘al or אתפעּל Eṯpa‘‘al (also written Hithpa‘‘al or Ethpa‘‘al), and the Ct-stem, התהפעל Hiṯhap̄‘al, אתּפעל Ettap̄‘al, השתפעל Hištap̄‘al or אשתפעל Eštap̄‘al (also written Hithhaph‘al, Ettaph‘al, Hishtaph‘al or Eshtaph‘al). Their meaning is usually reflexive, but later became passive. However, as with other stems, actual meaning differs from verb to verb. Not all verbs use all of these conjugations, and, in some, the G-stem is not used. In the chart below (on the root כת״ב K-T-B, meaning "to write"), the first form given is the usual form in Imperial Aramaic, while the second is Classical Syriac. In Imperial Aramaic, the participle began to be used for a historical present. Perhaps under influence from other languages, Middle Aramaic developed a system of composite tenses (combinations of forms of the verb with pronouns or an auxiliary verb), allowing for narrative that is more vivid. The syntax of Aramaic (the way sentences are put together) usually follows the order verb–subject–object (VSO). Imperial (Persian) Aramaic, however, tended to follow a S-O-V pattern (similar to Akkadian), which was the result of Persian syntactic influence. ^ Creason, Stuart (2008). "Aramaic" (PDF). In Woodard, Roger D. (ed.). The Ancient Languages of Syria-Palestine and Arabia (PDF). Cambridge University Press. ISBN 978-0521684989. Retrieved 10 October 2018. ^ Beyer (1986: 11) suggests that written Aramaic probably dates from the 11th century BC, as it is established by the 10th century, to which he dates the oldest inscriptions of northern Syria. Heinrichs (1990: x) uses the less controversial date of the 9th century, for which there is clear and widespread attestation. ^ Kilpatrick, Hilary (2013). "Modernity in a Classical Arabic Adab Work, the Kitāb al-Aghānī". In Smart, J. R. (ed.). Tradition and Modernity in Arabic Language And Literature. Routledge. p. 253. ISBN 9781136788123. Retrieved 10 October 2018. ^ Myers, Allen C., ed. (1987). "Aramaic". The Eerdmans Bible Dictionary. Grand Rapids, Michigan: Alban Books Limited. p. 72. ISBN 9780802824028. Retrieved 10 October 2018. It is generally agreed that Aramaic was the common language of Israel in the first century AD. Jesus and his disciples spoke the Galilean dialect, which was distinguished from that of Jerusalem (Matt. 26:73). ^ "Aramaic language". Encyclopædia Britannica. Retrieved 10 October 2018. ^ Roberts, Rev. Dr. Mark D. "What Language Did Jesus Speak?". Patheos.com. Retrieved 10 October 2018. ^ Chyet, Michael L. (1997). Afsaruddin, Asma; Krotkoff, Georg; Zahniser, A. H. Mathias (eds.). Humanism, Culture, and Language in the Near East: Studies in Honor of Georg Krotkoff. Eisenbrauns. p. 284. ISBN 978-1-57506-020-0. Retrieved 10 October 2018. In the Middle Iranian period (Parthian and Sassanid Empires), Aramaic was the medium of everyday writing, and it provided scripts for writing Middle Persian, Parthian, Sogdian, and Khwarezmian. ^ "City Youth Learn Dying Language, Preserve It". The New Indian Express. 9 May 2016. Retrieved 10 October 2018. ^ Heinrichs 1990: xi–xv; Beyer 1986: 53. ^ Naby, Eden. "From Lingua Franca to Endangered Language" (PDF). Assyrian International News Agency. Retrieved 10 October 2018. ^ Shaviv, Miriam (14 July 2013). "The last of the Aramaic speakers". The Times of Israel. Retrieved 10 October 2018. ^ a b c Richard, 2003, p. 69. ^ a b "The name Aram in the Bible". Abarim Publications. Archived from the original on 29 September 2018. Retrieved 10 October 2018. ^ "Hittites, Assyrians and Aramaeans". fsmitha.com. Retrieved 10 October 2018. ^ Yana, George V. (2008). Ancient and Modern Assyrians: A Scientific Analysis. Xlibris Corporation. p. 88. ISBN 9781465316295. Retrieved 10 October 2018. ^ "Aramaic Israelis seek to revive endangered language of Jesus". The Jerusalem Post. 9 November 2014. Retrieved 10 October 2018. ^ Younger, Jr., K. Lawson (1986). "Panammuwa and Bar-Rakib: Two Structural Analyses" (PDF). Archived from the original (PDF) on 4 March 2016. Retrieved 10 October 2018. ^ Beyer, Klaus (1986). The Aramaic Language, Its Distribution and Subdivisions. Translated by Healey, John F. Vandenhoeck & Ruprecht Gottingen. p. 14. ISBN 9783525535738. Retrieved 10 October 2018. ^ Shaked, Saul (1987). "Aramaic". Aramaic. Encyclopædia Iranica. 2. New York: Routledge & Kegan Paul. pp. 251–252. Retrieved 10 October 2018. ^ Frye, Richard N.; Driver, G. R. (1955). "Review of G. R. Driver's 'Aramaic Documents of the Fifth Century B. C.'". Harvard Journal of Asiatic Studies. 18 (3/4): 457. doi:10.2307/2718444. JSTOR 2718444. ^ Geiger, Wilhelm; Kuhn, Ernst (2002). "Grundriss der iranischen Philologie: Band I. Abteilung 1". Boston: Adamant: 249. ^ Stolper, John A. Matthew (2007). "What are the Persepolis Fortification Tablets?". The Oriental Studies News & Notes (winter): 6–9. Retrieved 10 October 2018. ^ Beyer. p. 28 n. 27; Wiesehöfer, Josef (2001). Ancient Persia. Translated by Azodi, Azizeh. I.B. Taurus. pp. 118–120. ISBN 9781860646751. Retrieved 10 October 2018. ^ Häberl, Charles G. (February 2006). "Iranian Scripts for Aramaic Languages: The Origin of the Mandaic Script". Bulletin of the American Schools of Oriental Research (341): 53–62. doi:10.7282/T37D2SGZ. JSTOR 25066933. ^ Darling, Cary (25 February 2004). "What's up with Aramaic?". Miami Herald. Archived from the original on 3 April 2004. Retrieved 10 October 2018. ^ Stefan Weninger (23 December 2011). The Semitic Languages: An International Handbook. Walter de Gruyter. pp. 628–9. ISBN 978-3-11-025158-6. ^ Emran El-Badawi (17 December 2013). The Qur'an and the Aramaic Gospel Traditions. Routledge. p. 35. ISBN 978-1-317-92933-8. ^ "Mandaic: A language of Iran". Ethnologue. Retrieved 10 October 2018. Frank, Yitzchak (2003). Grammar for Gemara & Targum Onkelos ((expanded edition) ed.). Feldheim Publishers / Ariel Institute. ISBN 1-58330-606-4. Heinrichs, Wolfhart, ed. (1990). Studies in Neo-Aramaic. Atlanta, Georgia: Scholars Press. ISBN 1-55540-430-8. Nöldeke, Theodor (2001). Compendious Syriac Grammar. Winona Lake: Eisenbrauns. ISBN 1-57506-050-7. Richard, Suzanne (2003). Near Eastern Archaeology: A Reader. EISENBRAUNS. ISBN 978-1-57506-083-5. Rosenthal, Franz (1995). A Grammar of Biblical Aramaic (6th, revised ed.). Otto Harrassowitz, Wiesbaden. ISBN 3-447-03590-0. Sokoloff, Michael (2002). A Dictionary of Jewish Babylonian Aramaic. Ramat Gan: Bar-Ilan UP; Johns Hopkins UP. ISBN 965-226-260-9. Sokoloff, Michael (2002). A Dictionary of Jewish Palestinian Aramaic (2nd ed.). Bar-Ilan UP; Johns Hopkins UP. ISBN 965-226-101-7. Waltisberg, Michael (2016). Syntax des Ṭuroyo. Semitica Viva. Otto Harrassowitz. ISBN 978-3-447-10731-0. .
Wikimedia Commons has media related to Aramaic language. Ancient Aramaic Audio Files: Contains audio recordings of scripture. Aramaic Designs: Website offering various designs based on historical Aramaic scripts. Lishana Online Academy: The first online academy on Spanish network to learn Aramaic in several dialects. For Spanish and Portuguese speakers. Aramaic Dictionary: Search the online dictionary using English or Aramaic words, including many other options. Aramaic Language: "Christians in Palestine eventually rendered portions of Christian Scripture into their dialect of Aramaic; these translations and related writings constitute 'Christian Palestinian Aramaic'. A much larger body of Christian Aramaic is known as Syriac. Indeed, Syriac writings surpass in quantity all other Aramaic combined." Aramaic Peshitta Bible Repository: Many free Syriac Aramaic language research tools and the Syriac Peshitta Bible. "An Introduction to Syriac Studies" by Sebastian Brock. Reproduced, with permission, from J. H. Eaton, ed., Horizons in Semitic Studies: Articles for the Student (Semitics Study Aids 8; Birmingham: Dept. of Theology, University of Birmingham, 1980), pp. 1–33. Akkadian is an extinct East Semitic language that was spoken in ancient Mesopotamia from the 30th century BC until its gradual replacement by Akkadian-influenced Old Aramaic among Mesopotamians by the eighth century BC. Syriac, also known as Syrian/Syriac Aramaic, Syro-Aramaic or Classical Syriac, is a dialect of Middle Aramaic of the Northwest Semitic languages of the Afroasiatic family that is written in the Syriac alphabet, a derivation of the Aramaic alphabet. 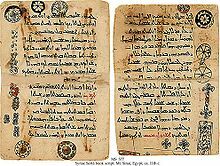 Having first appeared in the early first century CE in Edessa, classical Syriac became a major literary language throughout the Middle East from the 4th to the 8th centuries, preserved in a large body of Syriac literature. Indeed, Syriac literature comprises roughly 90% of the extant Aramaic literature. Syriac was once spoken across much of the Near East as well as Anatolia and Eastern Arabia. The Arameans were an ancient Northwest Semitic Aramaic-speaking tribal confederation who emerged from the region known as Aram in the Late Bronze Age. They established a patchwork of independent Aramaic kingdoms in the Levant and seized tracts of Anatolia as well as briefly conquering Babylonia. The Syriac alphabet is a writing system primarily used to write the Syriac language since the 1st century AD. It is one of the Semitic abjads descending from the Aramaic alphabet through the Palmyrene alphabet, and shares similarities with the Phoenician, Hebrew, Arabic and the traditional Mongolian scripts. Chaldean Neo-Aramaic, or simply Chaldean, is a Northeastern Neo-Aramaic language spoken throughout a large region stretching from the plain of Urmia, in northwestern Iran, to the Nineveh plains, in northern Iraq, together with parts of southeastern Turkey. Assyrian Neo-Aramaic or simply Assyrian, also known as Eastern Syriac, is a Neo-Aramaic language within the Semitic branch of the Afro-Asiatic language family that is largely spoken by Assyrian people. The various Assyrian Aramaic dialects, including Assyrian Neo-Aramaic, have been heavily influenced by--though not directly descended from--Classical Syriac, the Middle Aramaic dialect of Edessa, after its adoption as an official liturgical language, and they are ultimately also descended from Old Aramaic, the lingua franca in the later phase of the Neo-Assyrian Empire, displacing the East Semitic Assyrian dialect of Akkadian beginning around the 10th century BC. Asōristān was the name of the Sasanian province of Babylonia from 226 to 637.